Mark Ronson has been sitting atop the Billboard chart for two weeks with his banger Uptown Funk featuring Bruno Mars! Ronson is the step son of Foreigner guitarist Mick Jones. Born in the UK among British musical professionals and cultural elite, he grew up in the U.S., attending Vassar College and NYU. Ronson broke onto the music scene as a NYC club turntablist who then got into production and went on to win Grammys for his work with Amy Winehouse and Adel. I just love a club DJ done good. Uptown Funk is the lead single from his latest and fourth album, Uptown Special, that just dropped this week. Although this is his first hit to make a splash in the US, Ronson has been kickin’ it in the UK for some time. Will Uptown Special deliver more hits? 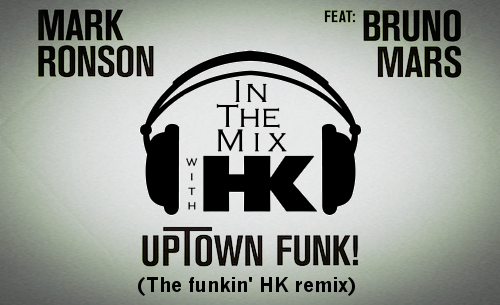 I haven't heard the whole album, so for now I don’t know, but I am L-O-V-I-N Uptown Funk and can’t wait to funk it up HK style this weekend! We're all going uptown when I put the HK sonic glaze on Selena Gomez, Hozier, Jennifer Lawrence, Iggy Azalea and Prince Royce. Plus reworkings on brand spankin' new jams from Olly Murs, Priory, Milky Chance, Ne-Yo and more! Remember…if it's hot, if it's new and it makes you wanna move…you're In The Mix with HK™. CROWDFUNDING…WHAT DO YOU THINK OF IT? MUSIC HAS TAKEN OVER THE FLAT SCREEN!